America is often referred to as “the land of the free,” but it is responsible for incarcerating 22% of the world’s prisoners. As of 2015, America had the highest prison population rate in the world. A big part of the prison population is made up of those who have been released but re-arrested – also known as recidivism. Recidivism, or a relapse into criminal behavior and further incarceration, is a growing problem in a country with an already high arrest and imprisonment rate. A study released by the United States Sentencing Commission followed more than 25,000 federal offenders over an eight-year period, and found that about half were rearrested, one-third were convicted again and around 25% of the offenders were jailed again. The American justice system’s intent is to rehabilitate criminals, but results from the Commission study indicate that the system is failing a sizable portion of the incarcerated population. Overcrowded prisons create a strain on taxpayers, and also on the families of those who are in prison. The study indicated that re-arrest rates decreased (35.1%) for those who were released into a probationary program, versus those who were released straight from prison (52.5%). Also, crimes on average were likely to be committed again within the first 21 months after release. Working with offenders before their release seems effective in decreasing repeated offenses, but each offender comes from different cultural backgrounds, and will face the same challenges he or she had before being incarcerated. Most are not well-educated or well off financially, so what can the system do to influence these rates? Education within the prison walls may help reduce the recidivism rate. By educating criminals before they go back out into society, they may feel more equipped to handle the pressures of re-acclimating to society. 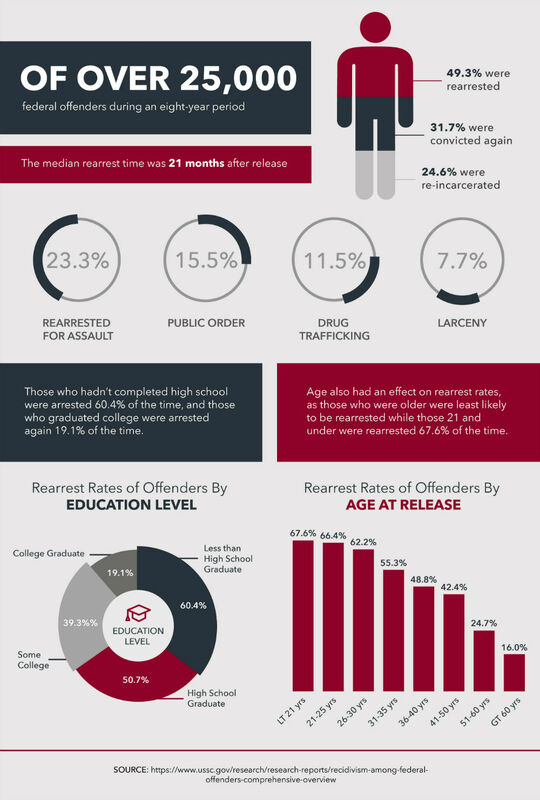 A lot of offenders are arrested at a young age, thus not getting the chance to finish high school or access higher education. Financial education, career counseling, and even offering diplomas and degrees to prisoners can also help alleviate problems they may have upon their release. Having an education makes it easier to apply for jobs that they otherwise couldn’t obtain. According to a 2015 Washington Post article, America has a less developed social services support system than other countries, which indicates that those with mental illness or substance abuse issues are sent to prison instead of to a facility that could help them. Local and state-level programs are in place, but there is no national system to implement a systemic change to relieve the incarceration rate. Programs with evidence-based interventions have shown to be the most effective in reducing recidivism, as stated in a 2015 report by The Council of State Governments Justice Center. Providing intense supervision and treatment for those at the highest risk of reoffending has been proven effective while trying to re-program offenders tends to be ineffective. A forensic psychologist may be of benefit in this case, as they often work with criminals and can provide reasons for their motive in committing criminal behaviors, and present strategies to avoid them in the future. A recent study from Florida Institute of Technology indicates that offenders who suffer from mental illness considerably reduced their re-arrest rates by graduating from mental health court. The study followed offenders for three years after their release, and found that for those who were repeat offenders, their subsequent crimes were not as serious. The lead researchers found that mental health court provides value not only in economic ways, but also societal ways, as it seems to be more effective than incarceration at reforming the mentally ill.
Another barrier to reentry for newly released offenders, according to a 2010 New York University study, is criminal justice debt. Many states charge offenders for jail time, court appearances and even for public defender assignments – referred to as “user fees.” These fees are intended to relieve budget issues within a state, not as a deterrence for criminal behavior. But they are often imposed on offenders who don’t have the financial resources to pay them and cause more problems for the offender. When the offender can’t pay the debt in whole, some states send the debt to private debt collectors who tack on 30 or 40% collection fees. The fees can add up quickly and result in thousands of dollars of debt that the offender can’t repay. Instead of repayment, many opt to just return to jail in an attempt to reduce their debt. The study concluded that states and lawmakers need to take a closer look at the user fee policy, as well as get rid of public defender fees, and instead look at offering community service programs to allow the offenders to pay back the courts in a different way.